As you may recall from my last post, I’ll soon be heading off with Robbie on a big 5-month adventure to parts of Europe and South America. In fact, time has gone by so quickly that it’s now only a few weeks until we leave. The rough plan is Amsterdam > France > Italy > Greece > Croatia > Slovenia > London > Peru > Colombia! Whilst away the hope is to immerse myself in a whole lot more cooking, writing and photography than I currently now fit in my schedule, and with that, I’ll hopefully be creating a lot more beautiful content, recipes and travel guides for you to peruse. I’m currently only churning out 1 post every 2 months (abysmal really) and it’s just not enough to satiate my passion. I love doing this and engaging with you all, but when life gets busy it can sometimes feel like a chore – but it’s not a chore I promise! So this trip is not only about discovering new and wonderful places, but it’s an opportunity to spend precious time fueling stuff I love doing. I’ve picked up my “tool game” in preparation with a new camera and lenses. I’m carefully selecting Airbnb’s within budget with light filled kitchens (not sure if Robbie has caught on to this one yet). I’m setting myself away-goals. And most importantly, we are factoring in a considerable amount of downtime. 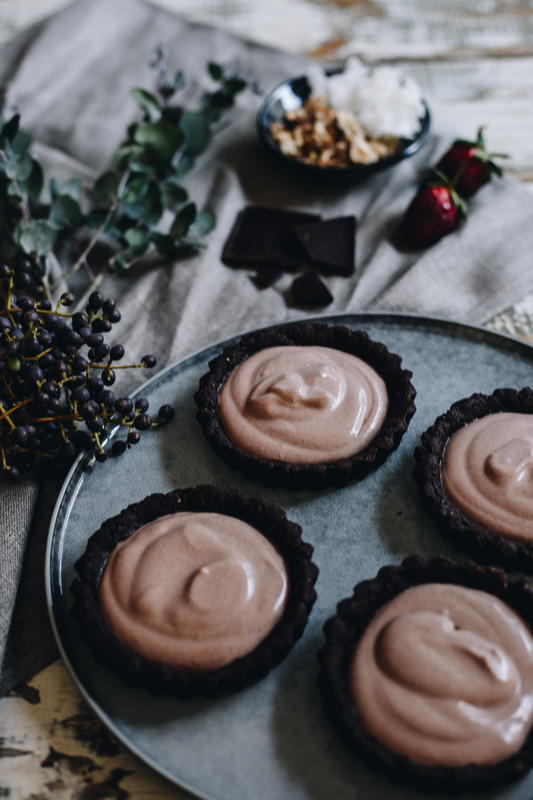 But before I shoot off, I wanted to leave you with a new recipe that is an absolute gem – vegan chocolate mousse tarts with a hazelnut crust. 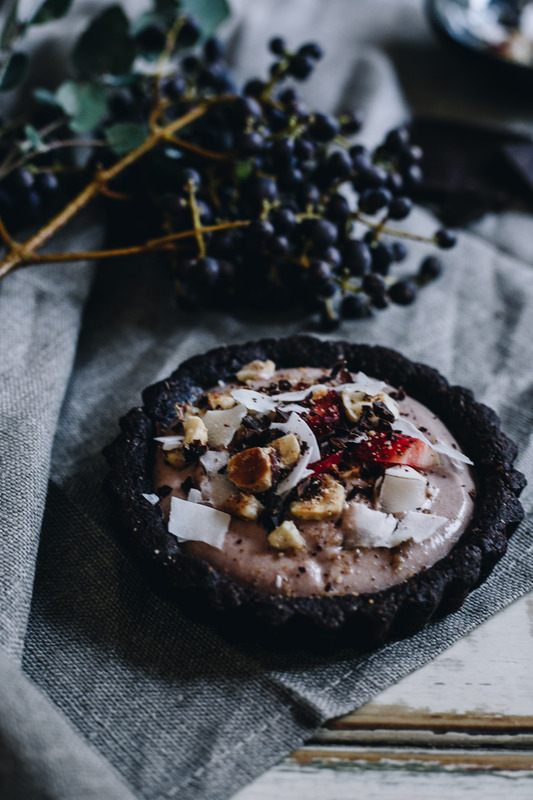 They’re as decadent as they sound, but quick and easy to make. The recipe can also be easily adapted to be gluten free by swapping out oat flour for rice flour. 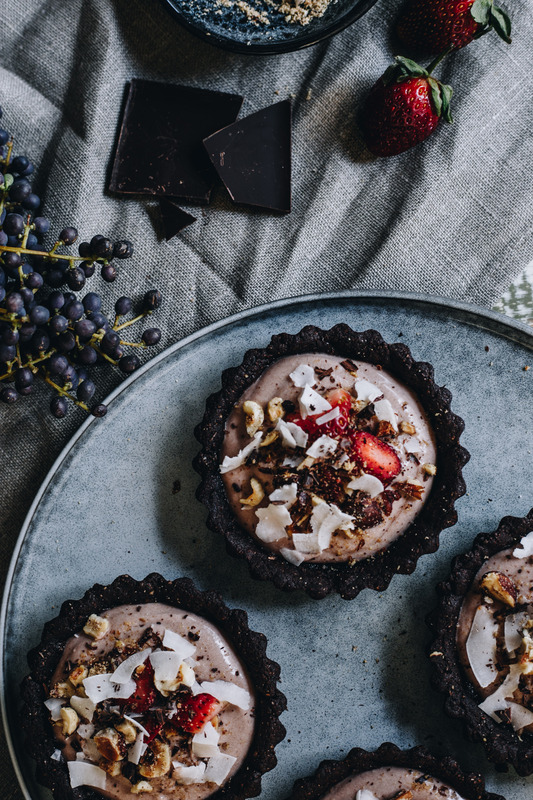 Or you can make it low FODMAP by either only eating half a tart in one sitting, or simply swap out some hazelnuts for the friendlier walnut. 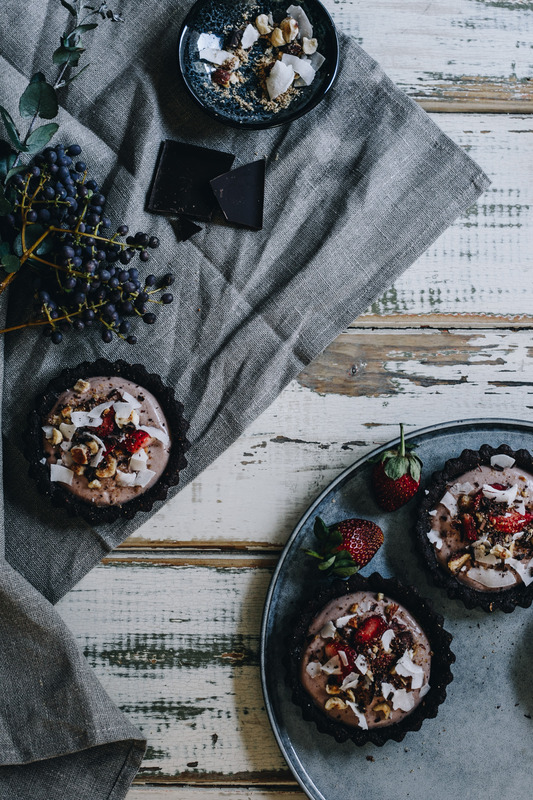 Follow my daily foodie adventures on Instagram @FriendlyLittleKitchen and leave me your Instagram name in the comments below so I can follow you back! Preheat oven to 160C and grease four small tart tins (or one large tart tin – but keep in mind you may need to make x1.5 of the filling for a larger tart). If required, use a food processor or blender to grind up some hazelnuts into hazelnut meal, and oats into oat flour. Grind until you have a sand like texture and transfer to a mixing bowl. Mix together with the remaining crust ingredients to form a soft dough. Divide mixture into four parts and press into each tart tin. Pierce the crust a few times with a fork and place in the oven to bake for 12-15 minutes. Remove from the oven and allow to cool. Carefully remove the tart shells from the tins and allow them to further cool down on a wire rack. 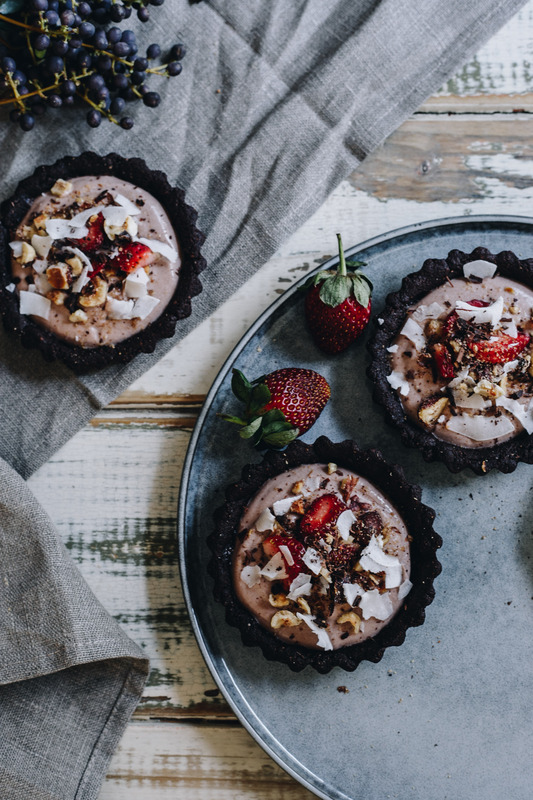 Whilst the tart shells are cooling, mix together the filling ingredients and prepare the toppings. 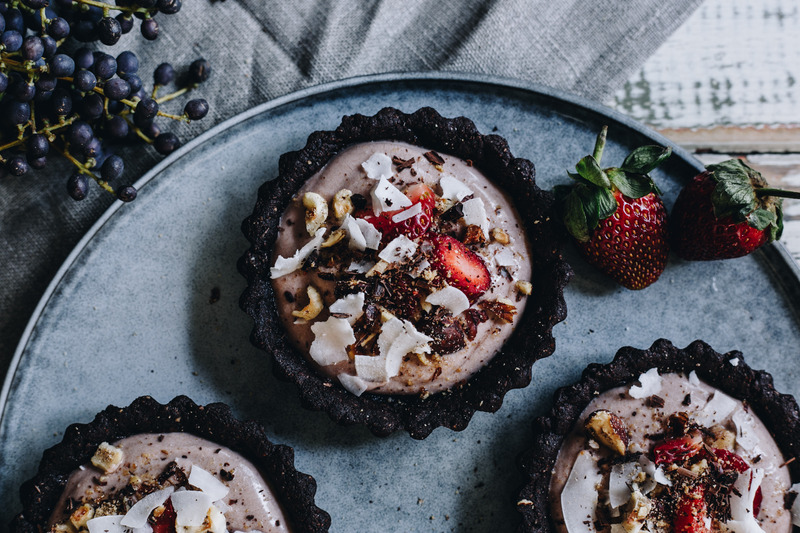 Spoon the filling generously into the tart shells and sprinkle with delicious toppings. If you don’t devour them all at once, store in the refrigerator to eat over the next few days.